It’s a brave woman who goes completely bare down there but more and more women are and the Brazilian and Hollywood are now standard beauty lingo. If you don’t fancy a professional wax (ouch), with a careful hand, a sharp razor and a good quality shaving lubricant you can achieve nearly the same look with no embarrassment, no hot wax and no discomfort. Here’s how to shave your bikini area… completely. The first step is to decide what style you want to achieve. Fundamentally there are 3 options when it comes to a ‘full’ bikini shave; hollywood (everything must go), stencil (creating a picture such as a heart using the remaining hair) and strip (leaving a thin, vertical strip of hair). The stencil is the most complicated as it requires some artistic flair and an attention to detail but is fun to try and if you fail dismally can always resort to the hollywood! Before you reach for the razor, trim your hair first with a sharp pair of barber scissors or an electric bikini trimmer. Any longer than a few millimeters and the hair will simply clog the razor making it very difficult and incredibly time consuming to shave. Trim hair across the whole area to be shaved - it doesn’t have to be a masterpiece but make sure it’s short all over. Once trimmed soften the hair by soaking in the tub or taking a hot shower for at least 15 minutes. 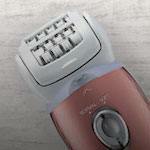 The heat, steam and water will soften the hair making it easier to shave cleanly. Use this opportunity to wash as the skin will be sensitive post-shave so you want to touch it as little as possible afterwards. As with all types of hair removal, exfoliation is absolutely key. Not only will it remove dead skin cells reducing the risk of ingrown hairs but it will also align the hairs so they all lie in the same direction making shaving easier. It doesn’t matter whether you use a body scrub or a shower mitt, just don’t miss this step. The best place to carry out the shave is in the shower as it is vital that the area remains wet. There are a variety of pre-shave products to choose from but go for one that is transparent, unscented, is designed for sensitive areas and contains a lubricant. The purpose of the lubricant is to create a protective barrier between the blades and your skin and allow the blades to glide across the surface not drag or skip. Never ever use a razor on your bikini area without water and a lubricant as it will cause irritation, burning and nicks. As with all sensitive areas it is a good idea to patch test your chosen pre-shave product 24 hours before use so you know it’s suitable for your skin type and won’t cause an allergic reaction - not something you want to discover afterwards! Always use a razor with new blades when it comes to shaving down below. The newer the blades the sharper they are and and the closer and more comfortable the shave will be. Look for a razor with a lubricating strip for extra protection. The bikini area is not the easiest area to shave but work methodically and use slow, careful strokes and you will get a good result. With a good lubricant and sharp blade you needn’t press the razor against your skin; let the blade do the work and go gently and smoothly. It can help to pull the skin tight to smooth out the skin and pull out folds and creases. Shave twice; on the first pass shave downward with the grain, rinse, lather up again and then on the second pass shave upward against the grain. If you miss a spot repeat as necessary and get it on the next pass but do try to make as few passes as possible as each one further irritates the skin and it’s already sensitive enough down there. Start with the front which is the easiest area to get to and then move down between your thighs. Here prop your leg on the shower wall or sink and work in horizontal strokes from the outside in. We suggest that you start with the side opposite your dominant hand and then move onto your weaker hand when you’re in the flow. Once you have finished rinse with clean, lukewarm water and pat (don’t wipe) the area dry with a soft towel. Finish up with a scent-free moisturiser to rehydrate and condition your skin. Moisturisers containing aloe are great for soothing your skin if it’s irritated and sore. It’s a good idea to leave at least a couple of days between shaves to give the skin time to recover. Hair grows back so don’t be nervous and have an experiment!